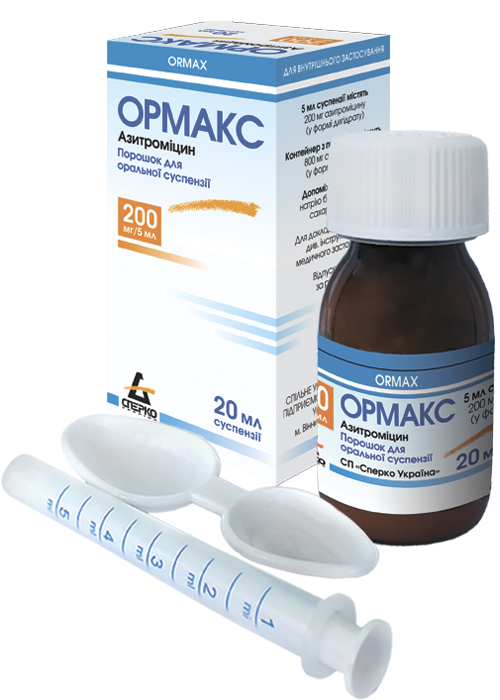 Ormax is azithromycin, product for the treatment of respiratory tract and ENT organs infections caused by sensitive microorganisms in adults and children more than 5 kg body weight. capsules – 250 mg azithromycin in dihydrate form and other excipients. Azithromycin is a macrolide antibiotic that exerts a bacteriostatic effect. concentrations of azithromycin in tissues are much higher (50 times higher) than the corresponding concentrations in plasma, a clear indication of strong tissue binding. terminal plasma elimination half-life closely reflects the elimination half-life from tissues of 2-4 days. skin and soft tissue infections: erythema migrans (early Lyme disease). Hypersensitivity to azithromycin, erythromycin or any macrolide or ketolide antibiotics or any other product component. Azithromycin and ergot derivatives should not be coadministered because of the theoretical possibility of ergotism. For detailed information on the medicinal product Ormax, please see “Package leaflet” page. Marketing authorization of MoH of Ukraine No.UA/11108/01/01 dated 09.10.2015, UA/11108/02/01 and UA/11108/02/02 dated 04.12.2015.